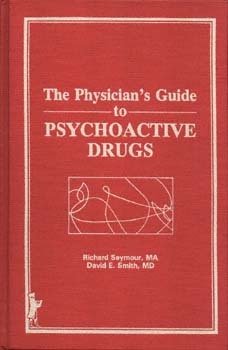 Here, at your fingertips, is everything anyone would want to know about the major and most powerful mind-altering drugs in use today. Compiled by two leading professionals from the renowned Haight Ashbury Clinic, this highly contemporary reference source provides comprehensive information on prescription, nonprescription, and street drugs. Included is information on the trademark, genereic, and popular names of drugs; the use and abuse of drugs; and their acute and chronic effects. Easy to read and well indexed, this book will keep you up-to-date on the rapidly changing world of drugs; it is a source for information that is important to both you and the people you care about. "A valuable guide for medical practitioners and other who work in the field of drug abuse. . . . Not only provides informative reading for the layperson but is also a concise and useful reference tool for the medical practitioner and social worker." "A sensibly written and largely jargon-free book. It examines the full range of psychoactive drugs available in modern America." Richard B. Seymour, MA, is Director of Physician Training and Public Information, Haight Ashbury Training and Education Projects, San Francisco. David E. Smith, MD, is Founder and Medical Director at the Haight Ashbury Free Medical Clinic in San Francisco.